The air is warm, the flowers are blooming…but nothing really says “spring” like a dump truck full of potting soil! First harbinger of spring! A cute little dump truck! First, soil blocks are great for growing seedlings because they’re inexpensive and the roots come out healthier than they do in small pots. Roots trapped in small plastic pots rapidly start going around and around the edges of the pot, creating a “root-bound” plant. 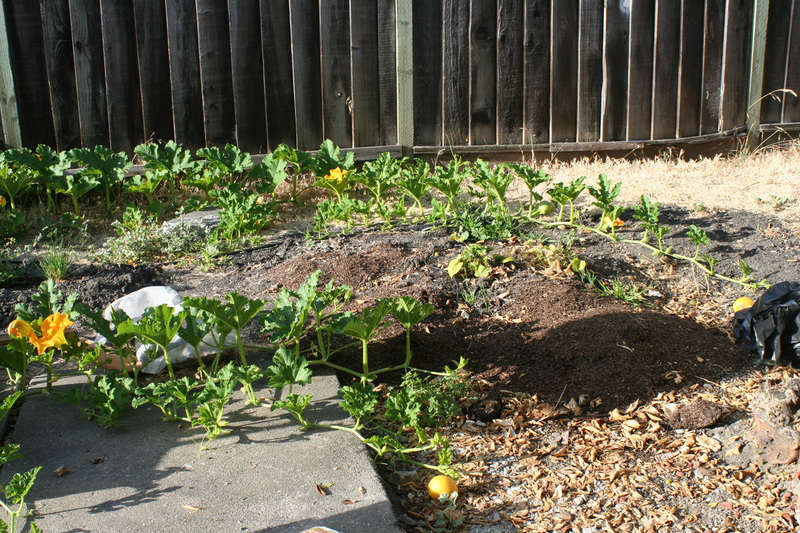 However, in soil blocks, the roots reach the boundaries and stop naturally because they are exposed to air. Nurseries don’t use them because the soil blocks are too delicate to manage commercially, but I like them better. To make soil blocks, you take your seed starting mix, wet it down thoroughly, and (using your soil block mold) stamp out a bunch of blocks into your seedling tray. Second, you may have noticed the unusual names on the labels in the foreground. These are the seeds that I’m growing for the Dwarf Tomato Breeding Project. It’s an intriguing project to breed tomato varieties that are well-suited for small-space gardeners. Most tomatoes have one of two growth habits. 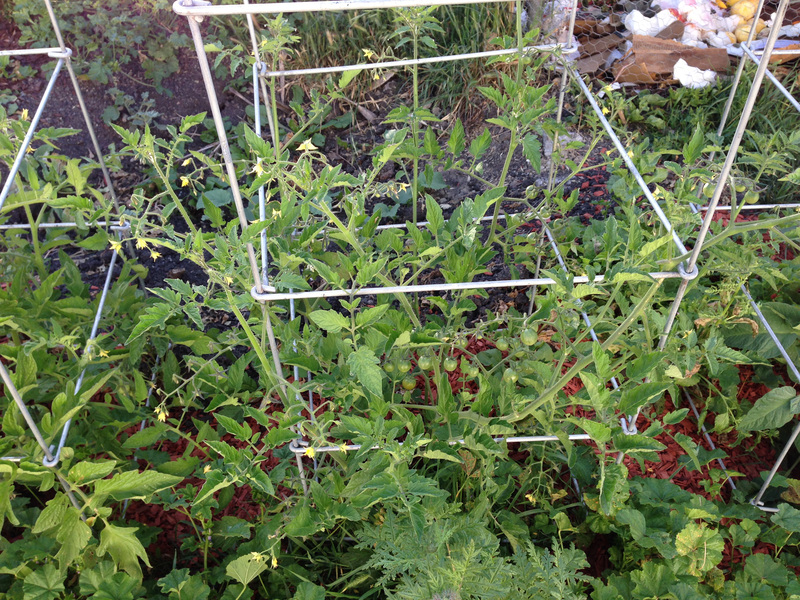 Indeterminate tomatoes never stop growing, and ripen their fruit gradually over the course of the summer. 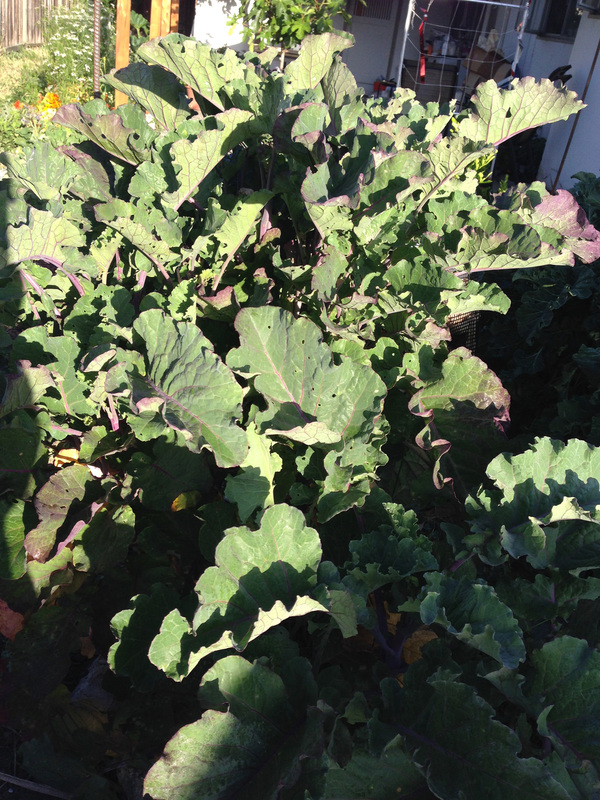 They’re not well-suited to container growing because they’re huge. 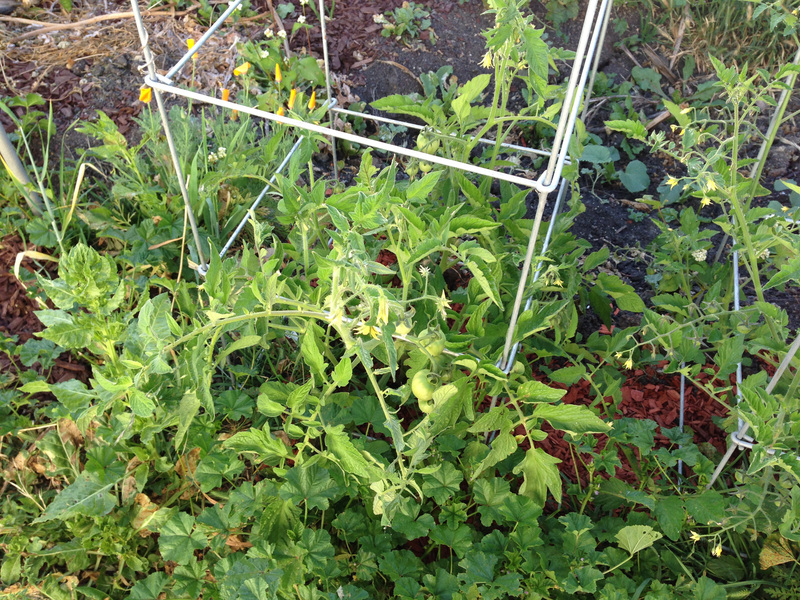 Determinate tomatoes, on the other hand, stop growing partway through the season, and ripen their fruit all at once. Because their size is self-limiting, they’re often recommended for container gardening. Unfortunately, determinate tomatoes don’t generally taste as good as indeterminate tomatoes. That’s because indeterminate tomatoes have a ton of leaves and a few fruit ripening at any given time, while determinate tomatoes have less leaf surface area and ripen all their fruit at once. Since foliage is where tomato plants get the energy to make sugar and flavor compounds, a lower ratio of foliage to fruit typically produces tomatoes that are not as sweet or flavorful. From the perspective of the home gardener, the other disadvantage of determinate tomatoes is that you get your entire tomato harvest at once. Determinate tomatoes were mostly developed for industrial tomato farmers to make harvesting more efficient. Commercially grown canning tomatoes are harvested by spraying herbicide to kill the plants once the tomatoes are starting to ripen, then coming back a week or so later with a mechanical harvester that strips the partially-ripe tomatoes off the dried-out vines and takes them off to the factory. Obviously this works much more efficiently if the entire crop ripens at once. However, most home gardeners would rather have a few tomatoes at a time over a long growing season than a two-week avalanche, then nothing. So determinate tomatoes aren’t great for container gardeners either. And that’s where dwarf tomatoes come in. Dwarf tomatoes are indeterminate tomatoes with a gene that makes them short. So they are container sized, but they produce their fruits over a long season. They also have a higher ratio of foliage to fruit, so the tomatoes taste better. However, there weren’t many dwarf varieties ten years ago. So Craig LeHoullier and Patricia Nunske Small started the Dwarf Tomato Breeding Project, enlisting tomato growers from around the world to help develop new varieties. This help basically consists of growing out the children of various crosses, reporting on their growth habits and fruit flavor, appearance, etc., and sending back seeds. This sounded like fun to me! so I signed up and will be growing three plants each of three breeding lines, to see what happens. If you are looking for container tomatoes, there are already 70 varieties available through the Dwarf Tomato Breeding Project – a list of vendors selling seeds is here. After several days of hard work, I’m almost done debugging. It’s a dreadfully slow and frustrating process, that can take up to fifteen minutes per errant thread. I’ve fixed crossed heddles, stuck heddles, empty heddles, broken threads, crossed threads, etc. (LOTS of etc.). And then, after ten or fifteen minutes of concentrated troubleshooting, I get to move on to…the next problem. After an hour’s work, I might have fixed six threads – seven, if I’m lucky. Then yesterday, just as I was giving up in disgust for the day, the mailman arrived, with an intriguingly squishy package with a handwritten address. Since I hadn’t ordered anything recently, I was a bit puzzled by its arrival. What a delight to find a small package of black and white silk yarn and a note from Wanda (one of my Chocolates for Charity donors) gifting it to me! She said it was unlikely to use it, but she knew I would, so she was sending it to me. I will indeed use it, Wanda, and it was a delightful end to an otherwise frustrating day of struggling with the loom. So thank you. The arrival of Wanda’s gift made me think, “Hey! Maybe I should give myself treats whenever I finish fixing a thread!” Bribery, of course, has a long and successful history, and since it works on the cats, I suspect it will work on me as well. (Because, of course, I am almost as smart as a cat, at least where treats are concerned. 😉 ) Since a friend gifted me with a box of delicious chocolate squares (from a chocolatier in Paris, no less! ), I plan to munch my way through the next dozen broken threads. I grew up with three big mulberry trees in our back yard – I have many fond memories of running around in the back yard under the trees, then coming in with purple feet, hands, and face. 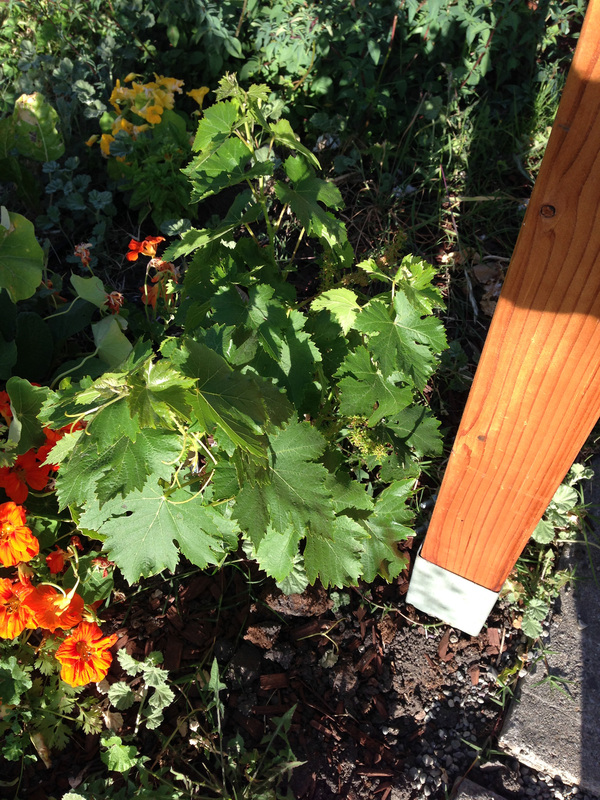 I’m very happy Mike planted mulberries for me. Our raspberries are also burdened with ripe fruit – only a little this year, as the patch is tiny, but delicious nonetheless. In a few years, after the patch has expanded, we’ll have enough to make jam. And did I mention the blueberries? And there are passion fruit, persimmons, peaches, plums, and figs on the way, too. All that hard work Mike put in a few years ago is paying off in abundance now. I just hope we can keep up with the harvest! And that is it for today…it’s time to get back to debugging! 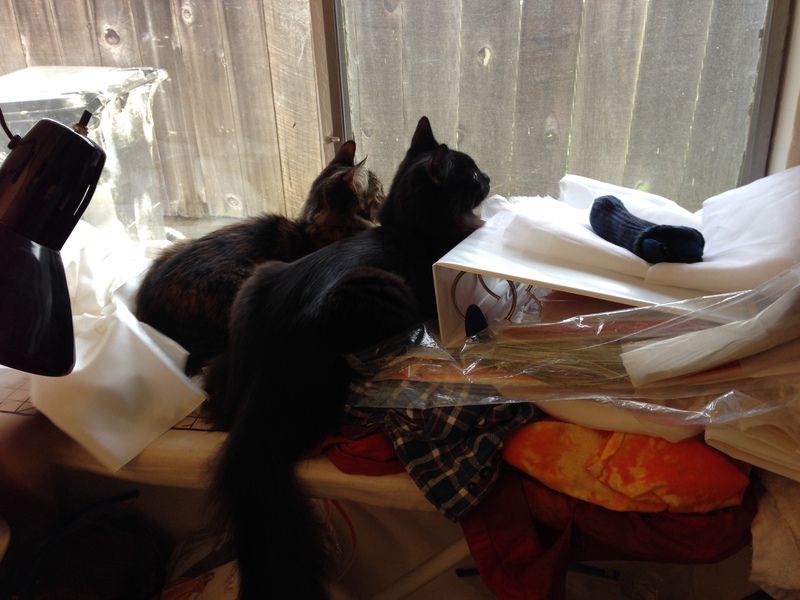 I’m down to three recalcitrant threads, so I hope to finish today. These are rayon embroidery threads designed for sewing machines…In the real piece, I will use hand-dyed silk threads, but rayon embroidery thread is available in a wide range of colors, making it useful for color sampling. With luck, I’ll be able to reproduce the colors in silk, using my large sample palette. Stay tuned for some Actual Weaving! I spend a lot of time telling you about my textile work, but today I thought I’d take a moment to showcase Mike’s interests as well. 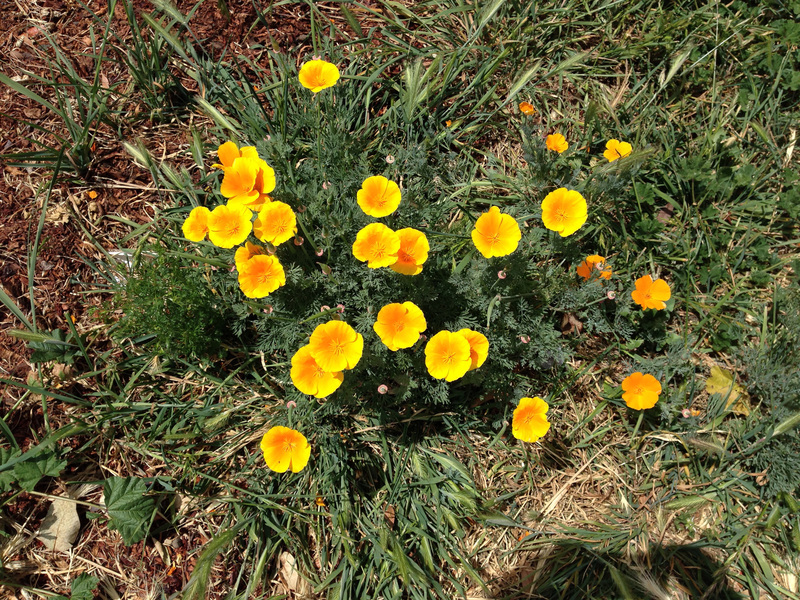 He is an avid gardener, and now that we’re into summer weather, his work is busting out all over. So I took some photos around our back yard; there’s more in the front, but I didn’t want to go out there in my bathrobe to take photos. Another day for the front! We’ll start with the herbs. 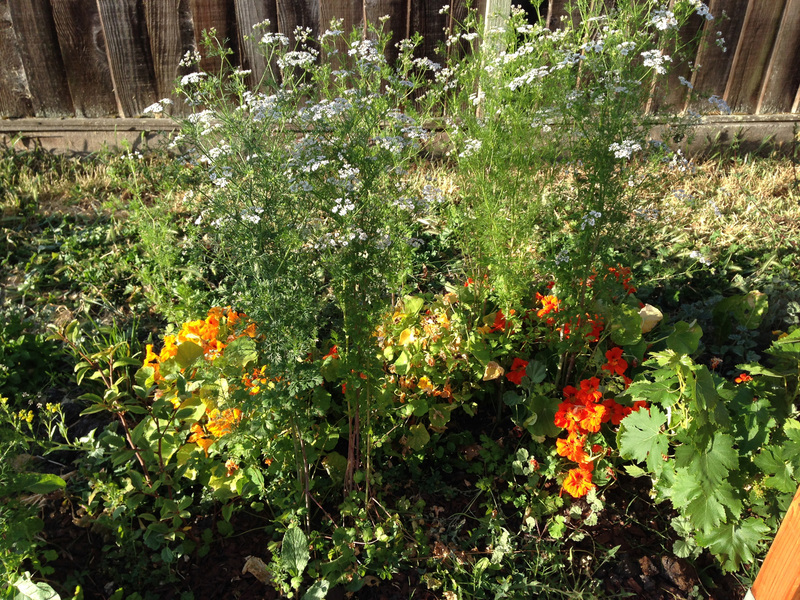 Here is some cilantro – it’s bolted, of course, so no good for cooking, but the flowers are beautiful, aren’t they? And the nasturtiums are blooming at their feet. 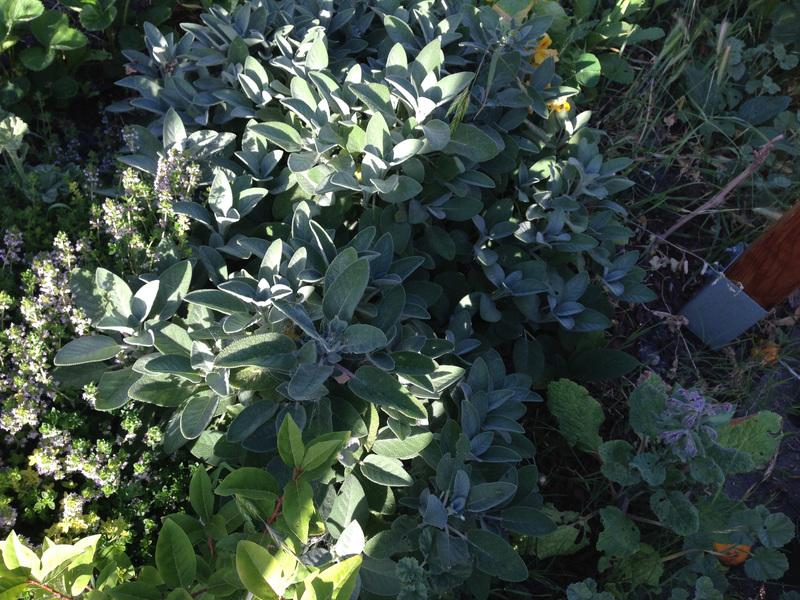 The leaves are good, too – peppery and pungent, good for salads (as are the flowers). 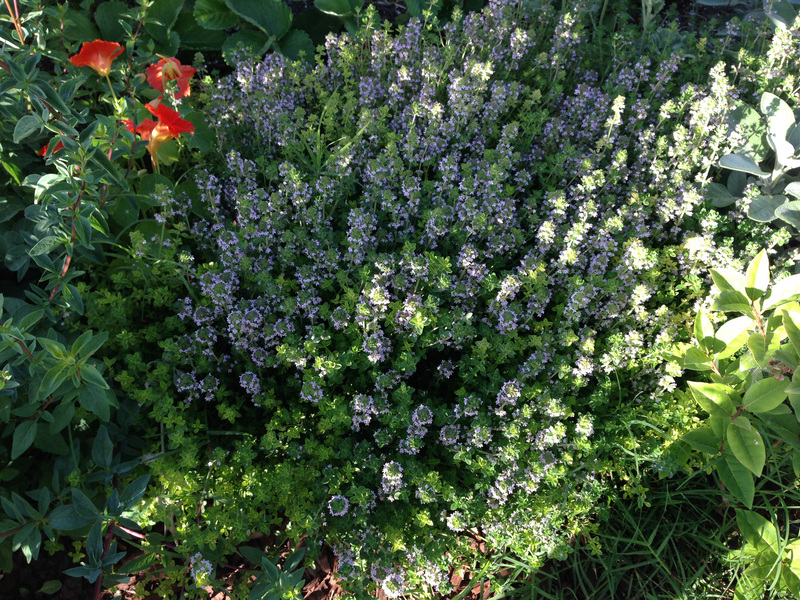 We also have oregano, several (tiny) bay laurel trees, lemongrass, horseradish, chives, garlic chives, comfrey, borage, and three kinds of mint (peppermint, spearmint, and pineapple mint). Needless to say, the mint is in containers so it doesn’t get everywhere. 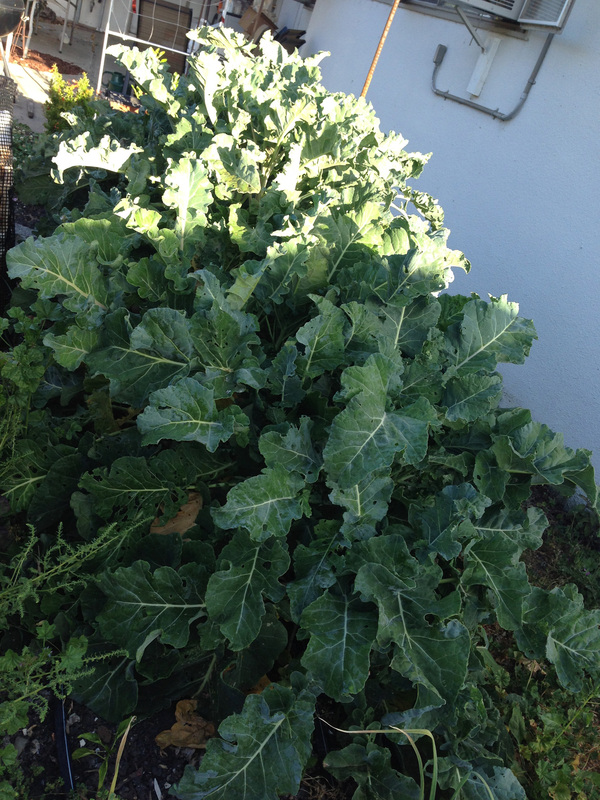 The tree collard, planted a few months ago, is churning out leaves. 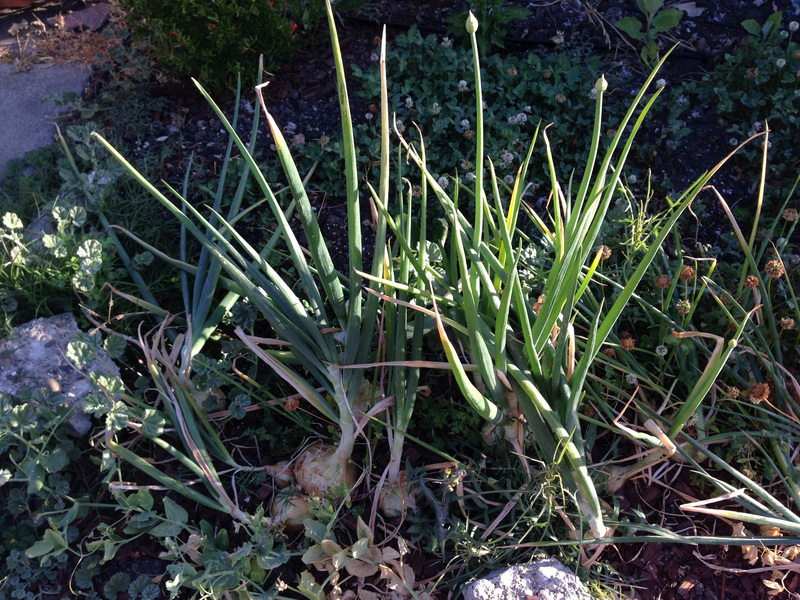 It’s perennial in this climate, and the leaves (especially the young leaves) are delicious when lightly sauteed. 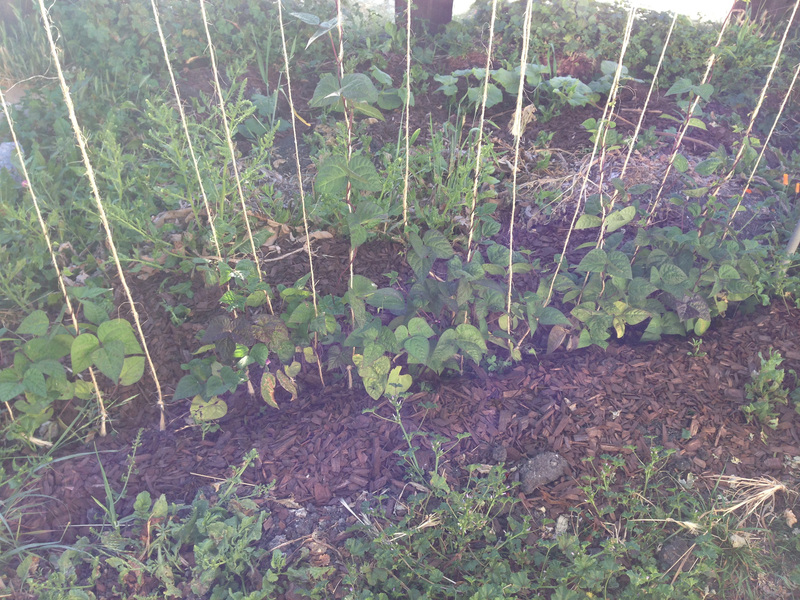 The green beans were one of the last plants started, but they are making good headway. We’ll likely get green beans in a month or so, and these are particularly delicious – purple podded pole beans. There are other vegetables, of course. 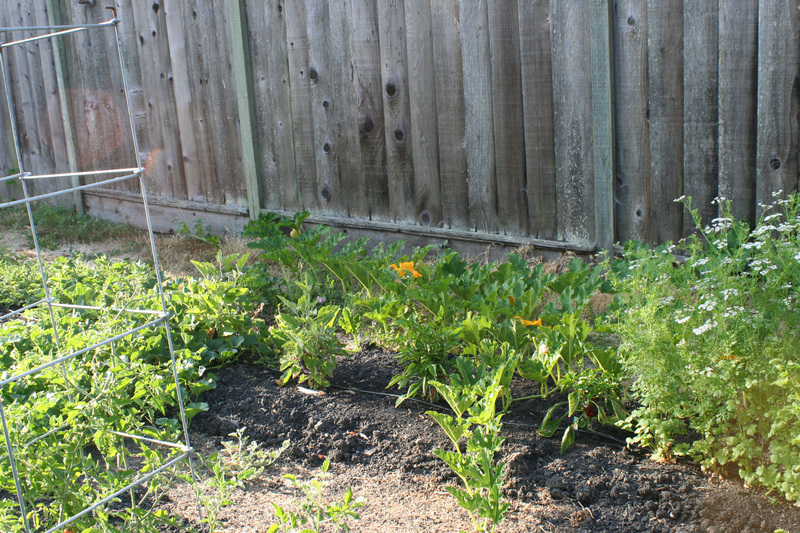 Several cucumber plants, ten or twelve varieties of pepper (sweet and hot), sweet corn, peanuts, and some melons. Out in front we have artichokes, asparagus, sweet potatoes, and eggplant. And our fruit trees are doing well. 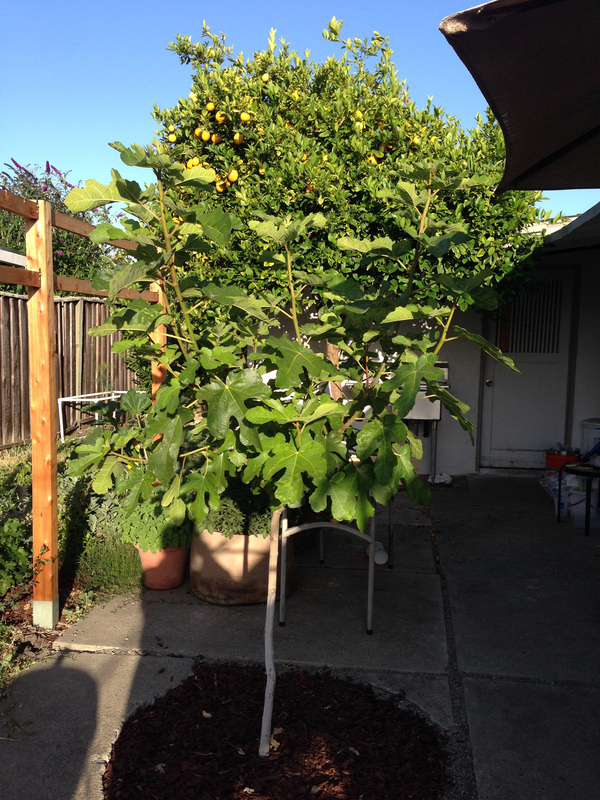 Here’s a photo of our Black Mission fig tree, with the Meyer lemon tree in the background. The lemon tree bears heavily enough that I drink fresh-squeezed lemonade all year. The lemon tree was there when we arrived (it was the only green thing in the entire back yard – the rest was dead, dry soil, with a few hardy weeds barely holding on), but Mike planted the fig tree last year. 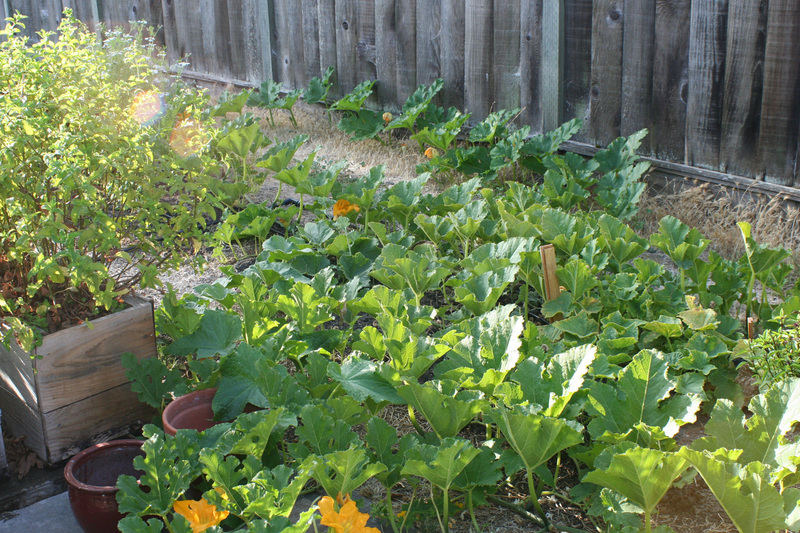 It’s been growing phenomenally, and I look forward to the figs. I love Black Mission figs – my favorite variety. If you’ve never had fresh ones, you’re missing something! Lest you think we live on a huge lot, we actually don’t. Our lot is only about 5400 square feet, and the house, garage, and driveway probably occupy half that. Mike has done a phenomenal job of fitting many plants into a tiny space, without crowding them. Pretty much the entire back yard is planted, and much of the front yard as well. We’re hoping to convert the rest of the front yard soon. 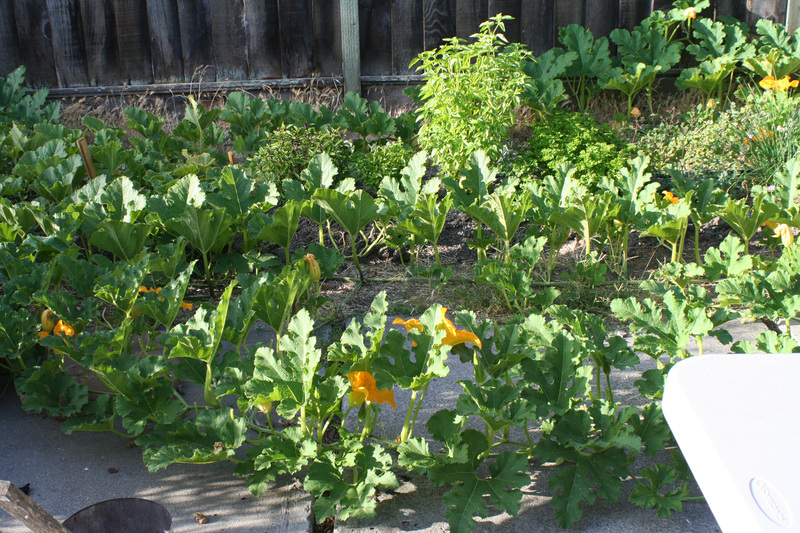 Who needs lawn when you can have tasty fruits and vegetables? Soon we’ll be rolling in delicious produce. And what am I doing this weekend? Jamming along. I am making seven kinds of jam and marmalade: bergamot marmalade (a double batch – yes, it’s that good! ), another batch of strawberry-blood orange marmalade, aprium jam with orange blossom water and almond, aprium jam with orange-blossom honey, blueberry jam, blueberry jam with a little mint added (the recipe sounded unusual and interesting, so I couldn’t resist), and my personal favorite – sun-cooked strawberry preserves. 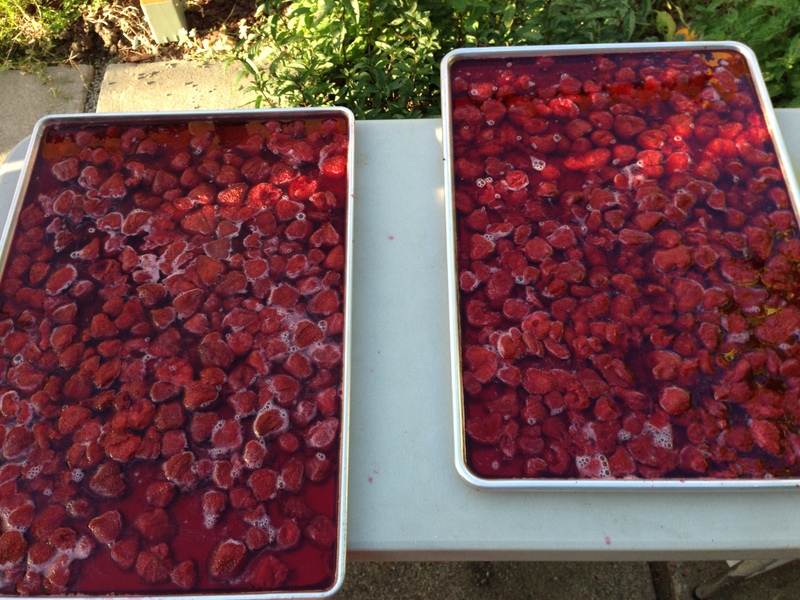 This is a lovely recipe that I encountered in Eden Waycott’s Preserving the Taste – basically, you hull an entire flat of strawberries, macerate them with sugar overnight to bring out the juice, add a little lemon juice, and bring the resulting strawberry-sugar-strawberry juice mixture to a boil. 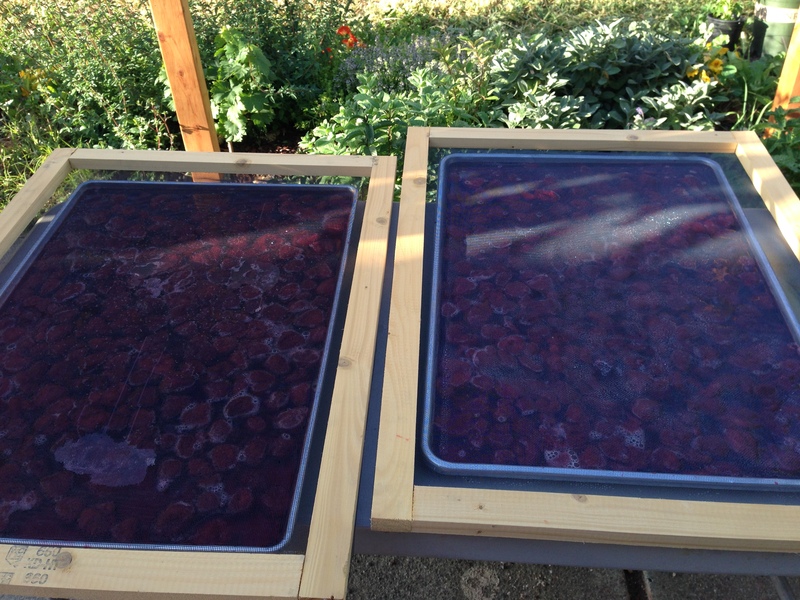 Then – and here’s the magic part – you pour the berries and syrup into large sheet pans, cover them with window screening, and set them out in the sun for a few days, bringing the sheet pans in at night. The sun evaporates the water, and the UV radiation in the sunlight keeps it sterile so it doesn’t get moldy. The one catch is that you need at least three consecutive sunny days for this to work! Fortunately, it doesn’t rain here between late May and October, so that’s no problem for us. The jam is the best strawberry jam I have ever tasted – rich, sinfully concentrated strawberry flavor, with just enough sweetness to count as jam. I use it in one of my favorite chocolate flavors, strawberry balsamic vinegar truffles, and it’s really what makes that flavor magical. 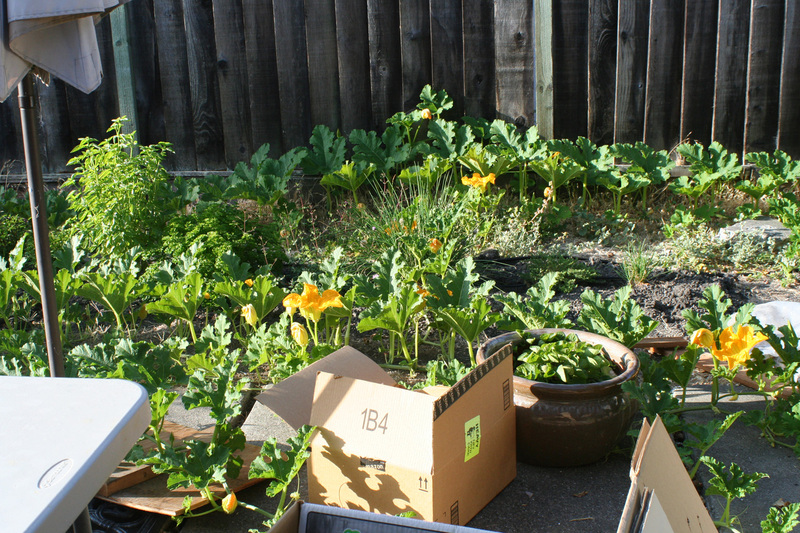 Perhaps you’ve forgotten all about the rampaging zucchini plant, last seen a few weeks ago. In any event, I thought it was time I provided an update. Â The plant, which I have affectionately (?) named Audrey II (devotees ofÂ Little Shop of Horrors will understand why), is continuing to rampage. Â It is also producing lots of “buds”, i.e. 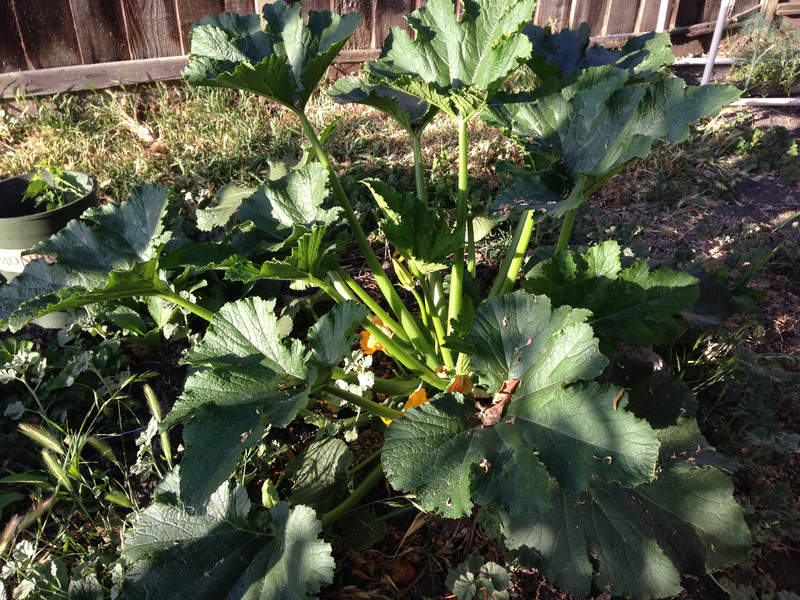 zucchini – about 2-3 of them PER DAY. Â If you consider that Mike and I eat on average two or three zucchini PER WEEK, you can understand the trepidation with which I view this flood of zucchini. Â It may well be that the planet is doomed!